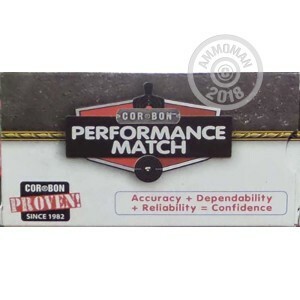 Competitive shooters of the AR platform will appreciate the supreme accuracy of this match grade ammunition from Corbon. These cartridges fire a 77 grain match bullet at a muzzle velocity of 2,800 feet per second. The weight of the bullet combines with its boat tailed profile to produce exceptional stability in flight for maximum precision. 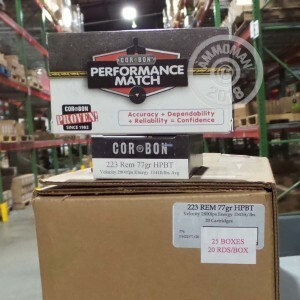 Corbon ammunition is loaded in Sturgis, South Dakota and uses reloadable brass cases and non-corrosive Boxer primers. Purchase a few of these 20 round boxes or any items totaling over $99 to earn free shipping from AmmoMan.com. No codes to redeem or shipping calculators to fiddle with--just easy savings if you buy enough at once.